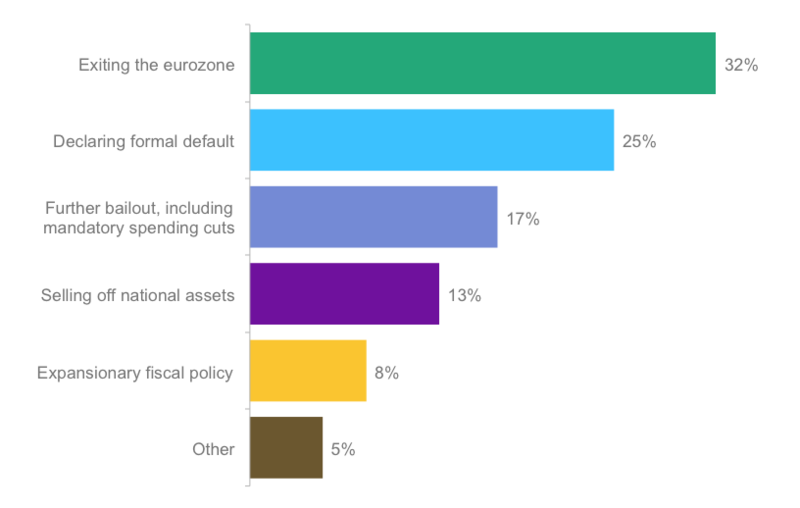 Poll: What’s the Best Solution to the Greek Sovereign Debt Crisis? What’s the best solution to the Greek sovereign debt crisis? When we posed that question to readers of CFA Institute Financial NewsBrief, the option that drew the highest proportion of votes (32%) from our 684 respondents is that Greece should Grexit, or exit the eurozone. Interestingly, the second most popular option — that Greece should formally declare default (25%) — is also a path to the Grexit. Only 17% voted for continuing with the bailout and austerity measures, the medicine applied by the European Central Bank (ECB), the European Commission, and the International Monetary Fund (IMF) since 2009. There is skepticism about whether more of the same can cure Greece’s debt problems. But unlike our respondents, decision makers do not seem to support the Grexit. The leftist party Syriza, which is leading in the polls before the upcoming parliamentary elections on 25 January, is against austerity, which is blamed for unemployment topping 25%, but does not favor the Grexit. What is the best solution for Greece in addressing its sovereign-debt crisis? Economists, unsurprisingly, are divided. Some argue that Greece staying in the eurozone is worse than Grexit; others say that Grexit could happen by accident. In Greece’s story of anti-austerity politics and unsustainable debt, the only certainty is that all options involve risks and reforms. The Greeks have never paid their sovereign debt. They need to be held accountable. A “Grexit” is one possible option. But, back in the 70’s the Latin American debt problems were fixed by exchanging debts with other countries with similar problems and then denominating the debt in the other country’s currency. That way both countries are incentivized and benefit from their efforts to solve their economic problems. It worked. Greece owes about 357 billion dollars of debt to all outstanding creditors. The best solution would be for the EU central bank to buy all of Greece’s outstanding debt and convert the current balance to a one percent interest rate. Similar to what Alexander Hamilton proposed back in the day. The EU central bank would then set a Greek repayment plan so Greek debt to GDP would be reduced to under 10 percent in 30 years. The repayment plan would be a fixed amount. * Greece must consistently reduce its debt to GDP ratio every year (Greece should be left to devise how they do this).